Irina Shayk and Stella Maxwell link up once again for The Kooples spring-summer 2019 campaign. The new season introduces new imagery as well as updated iterations of their exclusive bag collaboration with the French brand. Fittingly called ‘Irina’ and ‘Stella’, the designs come in quilted and leather versions. 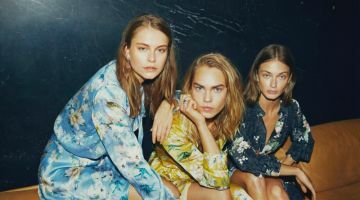 The models pose on city streets wearing trendy styles including floral print dresses, pantsuits and relaxed separates.